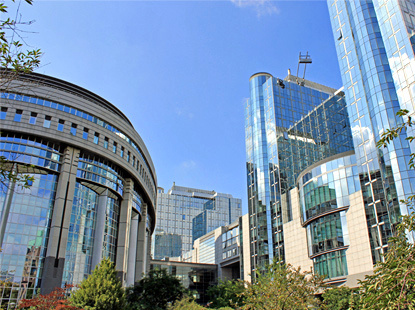 Brussels is the seat of the European Parliament (the EU's legislative body) and the European Commission (the EU's executive body). The European neighbourhood is roughly comprised between the Royal Park, the Jubilee Park and the Leopold Park, i.e. between Arts-Loi, Trône and Schuman Metro stations. Its main thoroughfares are Belliard Street, Law Street (Rue de la Loi in French, Wetstraat in Dutch) and Joseph II Street. It is one of the most modern part of the city, along with the new business district west of the North Station. 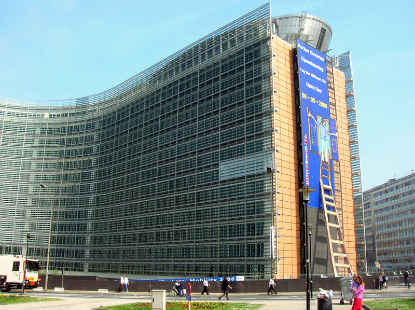 The European Commission has its headquarters in the Berlaymont building, while the and the Council of the European Union is located in the Justus Lipsius building opposite, both in Law Street. Once a year, usually on Europe Day (9th May), the main EU institutions open their doors to visitors for a day. This is a good opportunity to see the meeting rooms of the EU Commissioners and European heads of state in the Berlaymont and Justus Lipsius buildings. The European Parliament's main entrance is in Belliard Street, just above the Brussels-Luxembourg Railway Station. 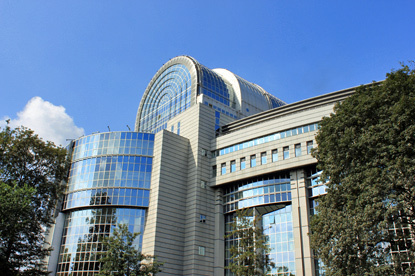 The EU Parliament is made of of two wings, the Paul-Henri Spaak building (constructed from 1988) and the Altiero Spinelli building (erected between 1991 and 1997). The whole parliament has an built area (on the ground) of 35,000 m2. The EU Parliament is open to visitors. When the parliament is in session, headphones give almost instantaneous translations of what is being said in all of the EU's 20 official languages. Each year, the European institutions open their doors to visitors Europe Day (5th May, open doors on 4th May if the 5th is a Sunday). This is the opportunity to have a look inside the Berlaymont building, home of the European Commission, see where EU heads of governments hold summits at the Council of the European Union, take a guided tour of the European Parliament, or visit any of the numerous other EU institutions in the neighbourhood, such as the Committee of the Regions, the European Court of Auditors, or the European Ombudsman, among others.